When Rosen’s team proposed Syncom, many of the nation’s top experts, notably at Bell Labs, thought they were on the wrong track. Instead, Bell Labs and others were working on a large network of satellites in low Earth orbit that would require a complex system of ground tracking stations. Rosen was confident that he could build a satellite to operate at 22,000 miles directly above the equator, which would allow it to remain stationary and provide continuous coverage over a third of the world. The problem was that American rockets of the 1960s lacked the power to launch heavy payloads to high orbits. Rosen would have to keep Syncom as light as possible, which became the key to its success. Top Hughes executives were reluctant to invest in a prototype, even after Rosen, Williams and Hudspeth each offered to invest $10,000. Rosen went to government offices, universities and competing electronics companies to find encouragement and a financial partner. After Raytheon Corp. offered Rosen and his team jobs and the chance to develop Syncom there, Hughes executives changed their minds and committed to a $2-million investment. “It was a vindication for everything we had gone through,” Rosen said. Rosen pioneered the overall concept and design: The satellite would remain stable by spinning like a gyroscope, and a propulsion system would maintain its orbital position. The barrel-shaped spacecraft was covered by solar cells that supplied electrical power. Hudspeth designed an extremely lightweight antenna and the satellite’s electronics. Williams came up with a key innovation: using a single lightweight rocket engine to control the spinning satellite’s position with short bursts of thrust. The resulting Williams patent, by itself, yielded Hughes millions in royalties. By 1961, they had built a working 55-pound prototype, which they took to the Paris Air Show and used to transmit photos across the room. 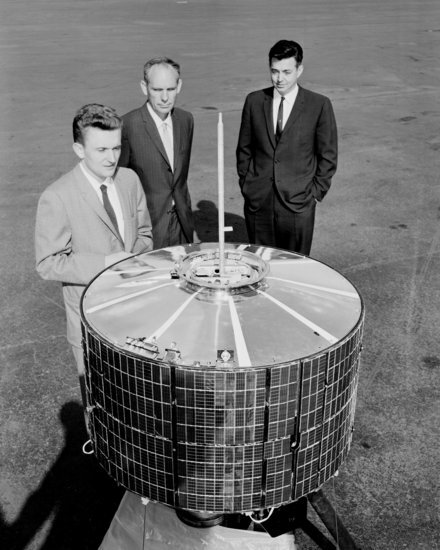 Don Williams, left, Thomas Hudspeth, center, and Harold Rosen designed the electronics, propulsion and power system for the Syncom communications satellite. This photo shows Syncom 3, which launched in 1964. The trio still needed federal government support to build and launch an operational version, though. Help came from a former Hughes executive, John Rubel, who was deputy research director at the Defense Department. Rubel was overseeing a troubled attempt by the Pentagon to build its own communications satellite. Virtually no hardware had been created and the projected weight was in the thousands of pounds, recalled Rubel, now 93.